Last week was a great week in Baton Rouge and Gary! Former U.S. Senator Mary Landrieu took time out of her day to tour both of our schools in Baton Rouge. We are serving more than 1,200 students this year in Baton Rouge. Senator Landrieu has been a stalwart supporter of what works for kids when it comes to schools. She currently sits on the board of directors of the National Association of Public Charter Schools. She spent half her day visiting our classrooms, listening to our leadership, and sharing her passion for high quality schools. 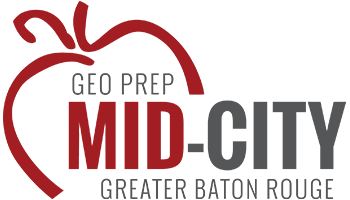 Our schools are the best performing open enrollment schools in Baton Rouge. Deputy Superintendent Dana Peterson and New Schools Baton Rouge CEO Chris Meyer joined us for lunch and shared their support for our schools, too. Our board chair, former BESE State Board Chair Linda Johnson, led the discussion and tours. It was a really great visit! Thank you Senator Landrieu for your support! 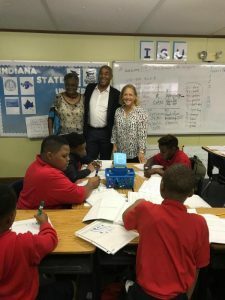 And while I was in Baton Rouge, I received updates and pictures from our Gary school (see below). See all those red shirts? Those are our students at college orientation day. No, they weren’t learning what it would be like to be a college student, they were signing up for their college classes at Ivy Tech Community College and Indiana University NW. We have nearly 100 high school students enrolled in college and career classes this year in our Gary schools. We have budgeted to spend more than $200,000 on college credits, textbooks and transportation this year. That’s what I call putting your money where your mouth is. And, it’s worth it! So, here’s a pitch to you for support. We are putting our money where our mouth is. Can you help us? Match us? We prioritize college classes, textbooks and transportation as well as college tours, FAFSA nights, SAT and ACT prep classes, and more. We do so by cutting back on other necessary programming at our schools. If we had a match, and/or support for what we are doing, we could provide more college and career counseling services to our students. And yes, our students need all the help we can provide. So, if you are in a philanthropic mood–or you know a corporation or foundation or individual who is–please consider supporting our efforts today. And if you want to introduce me to someone you think could help, please do. I’m happy to visit. Your contribution is tax deductible and your contribution will go directly toward students earning college credits and/or career certifications. In short, you will be helping us beat poverty! What could be better than that? Click here to donate today! Thank you for your consideration!